The farmers are truly in need – this was made clear by their protest last week. 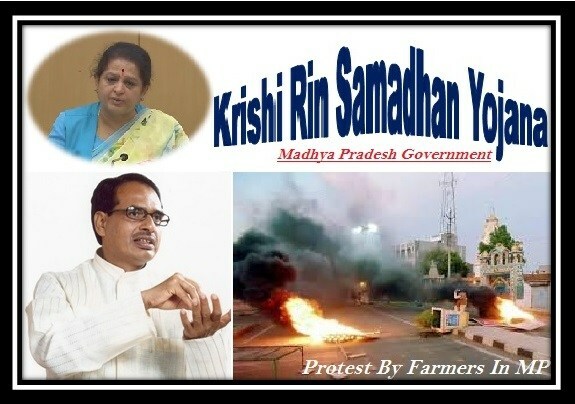 Due to this protest, the state government of Madhya Pradesh launched a new scheme called Krishi Rin Samadhan Yojana. As the e name suggests, this scheme will help the farmers manage their loans so that they don’t feel burdened by it. The scheme was launched by the Chief Minister of the state Mr. Shivraj Singh Chouhan. The scheme has come right after the protests. On 7th June 2017 the government announced this scheme along with a few other details related to the scheme. An emergency meeting was held, which decided that this scheme should be launched. The Madhya Pradesh government is all set to give loans to farmers at a lower interest rate under this scheme. The farmers will also receive help in getting the loans from the banks. The new scheme will not just help them get loans but will also help them to get further credit. The financial institutions will come to aid for this very purpose. Budget allocation – The state government has allocated a Budget of Rs. 1000 crore for this scheme. Its successful implementation will help alleviate the poor condition of the farmers in the state. The government has already started purchasing grains such as Toor Dal, Moong Dal and onions at a minimum price. They will continue to purchase till 10th June at 22 districts in the state. A commission will be set up for this purpose. The commission will find out ways to ensure that the farmers are earning profits from their crops and produce. In fact, the state government might come up with a justified rate for this. Recently the farmers in MP have started protests to get a loan waiver. They are also demanding fair prices for their crops. The matter took an ugly turn on 6th June when the police fired guns at the farmers. Under this firing 6 farmers were killed and 8 of them were also injured. The matter is under a judicial probe right now. Among the other demands, the farmers also demanded a raise in their products. They say that they have to spend Rs. 37 per litre of milk. Therefore they must be allowed to sell milk at Rs. 50 otherwise they will not incur any profits. Due to their protests, the prices of vegetables and milk have risen. According to India Today, the Prime Minister, Mr. Narendra Modi, will hold a meeting to discuss the situation. Top leaders like Sushma Swaraj will be present in the discussion. The Bharatiya Kisan Sangh has already called off the strike following the events of 6th June, but some other farmers are still continuing. Meanwhile to aid the farmers, the Chief Minister Shivraj Singh Chouhan has announced that a compensation of Rs. 1 crore shall be provided to those farmers who have died in the protest. Those injured in the protest shall get a compensation of Rs. 5 lakh. Apart from this, the state government has also launched several welfare schemes. The farmers will be benefitted under the Krishi Rin Samadhan Yojana.